Christmas is coming, are email volumes on the rise? Christmas is coming. With the holiday season, it’s the same procedure as every year: Email volumes tend to reach new highs. However, this doesn’t necessarily apply to all markets. Here’s how to use the figures below: Hover over the legend to highlight a certain sender. Click this sender to view her alone, or untick the ckeckbox to exclude her data. Hover over the chart to see, how many emails I got per week of the year. Finally, use the slider at the bottom to drill down into a specific date range. The dataset, which underlies the figures above, is a list of emails from numerous senders that reached two of my GMX inboxes. It has been deduplicated and grouped by sender and week of the year. All senders then have been matched and filtered by lists of the most important ecommerce players in Germany and in the United States. There are some mismatches like Ehrmann <=> Thomann, but the quality should be ok for glancing at changes in email volumes over time. Pressure from email advertising during the holiday seasons differs from country to country. 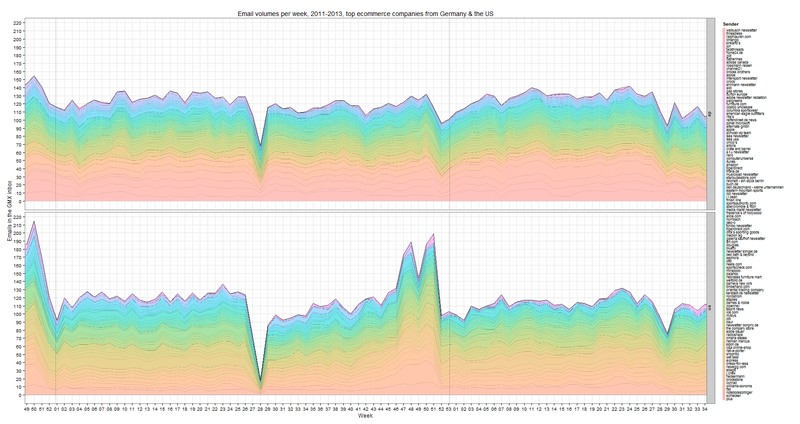 While email volumes peak remarkably high in the US, German marketers open the tap far more cautiously. Overall, email volumes have been quite stable from the end of 2011 until today (= mid-October 2013). One might see a little downward trend for Germany in the interactive chart. Perhaps, like with benchmark reports, one should also take those alerts not too serious that claim new all-time highs. The data also reflects the insolvencies of Schlecker (August 2012) and Neckermann (November 2012) by drops in email frequency. Use the slider to check these time frames in the first chart. Some retailers stopped mailing me, or they didn’t make it past the GMX spam filters anymore. Most notable senders are Lidl (July 2012), Williams-Sonoma (August 2013), Neiman Marcus (July 2012), Crate and Barrel (ditto), and Alibris (ditto). Lower-volume weeks during the holiday season are (1) before Black Friday-week, (2) 1st december week, and (3) the week after Christmas Eve in the United States. 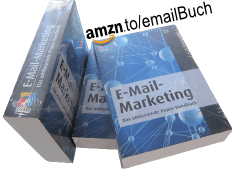 In Germany, email volumes climb from mid-October to Christmas Eve. In Germany, much of the email pressure is caused by only a few senders. More than one out of three emails (~36%) originated from 10% of the included senders. In the US, it has been only 28% of emails – the level of concentration isn’t that high at the bottom end. My subscriptions don’t claim to be representative – #funfacts. This entry was posted in english and tagged xmas. Bookmark the permalink.